HH: Lothar – I’d like to start by talking about your drawing process. What is the starting point for your recent works - and how do they relate to your earlier drawings? LG: Lots of these drawings are the ground plans for imagined spaces or situations; they are sometimes very clearly for a certain person or situation. I did a series called Houses for Bauhaus Masters - they are imagined villas or domestic spaces, each a bit like an abstract portrait of someone at the Bauhaus. From these I started doing drawings [Example: Garten Haus, 2008], which were probably more removed from the ground plan. They were meant as structures or ground plans for a spatial idea. It has changed a bit for these new line drawings, where I would say that the formal aspect is not so important; they are more about a setting and more vague in that aspect – more about over-layering. The aspect of the process has become more important, but they are still spaces. They have more to do with colour and light and line. And they describe something like a situation or a moment in life (things which are not definable) – probably in that way more abstract than the others. The others are probably more an abstraction of an idea, where they start with a very simple formal structure. 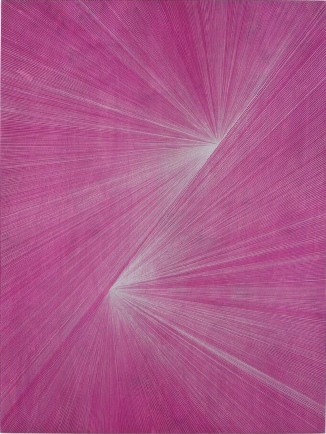 HH: I was intrigued by the surface of one of your recent drawings Purple Rain (2014), in which the wood grain remained visible through the background wash of gouache. Is the quality of the surface material important to your drawing in general, and does this relate to your negotiation of pre-existing and often imperfect surfaces in your site-specific wall paintings? LG: I want to see the material. The wood does kind of break up the line a little bit, I like that quality because you can see the irregularities. This is similar in the wall paintings… I like the history of a wall, even if there is unevenness, or if the wall curves a little bit. Before you start working with a wall, you don’t really notice lots of things. I find it quite interesting that spaces that look, at the first view, really perfect, the moment you start working with them you realise that it is not true. Or the moment that you stop the wall being all white, you notice what is added or different. I enjoy it more to work in spaces which are slightly difficult or are slightly muddled up. I find the perfect space a little bit scary, because if there are no imperfections at all, the first statement is quite radical. HH: Are your colour arrangements pre-determined or do they develop during the drawing process? LG: I do plan, partly – I obviously choose the background colour, and then I choose a set of colours – usually I select around eight. But I do break these rules; if I want a different colour I add that, it's quite responsive. I think of it like painting with pencil. 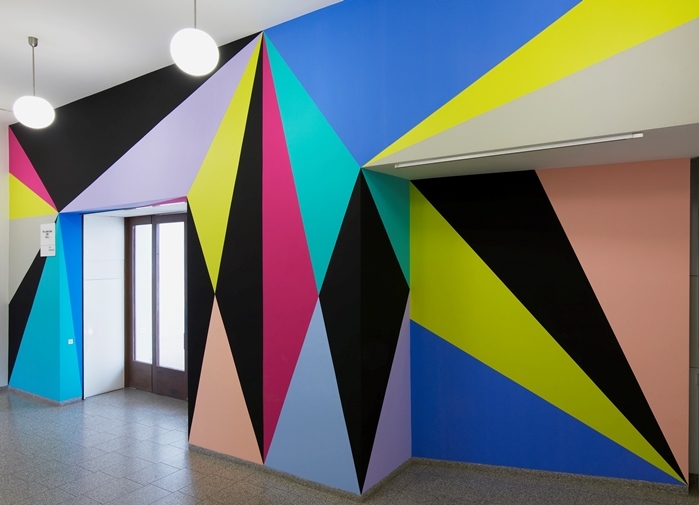 In the site-specific work, which is designed for the spaces, it is never completely independent. It is always a play, or a conversation with the space. 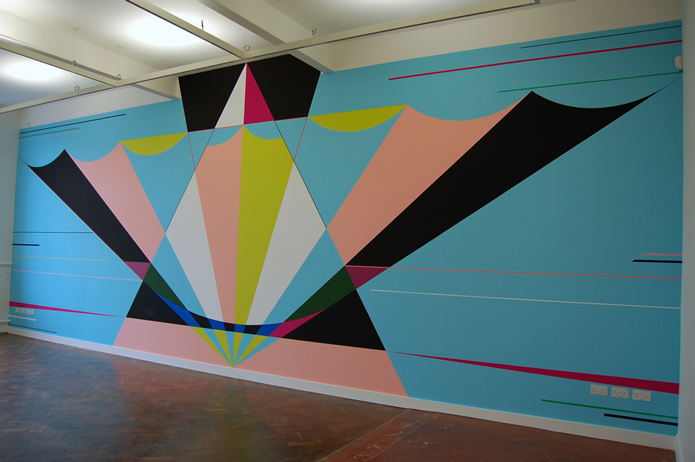 HH: Are the formal ideas for your site-specific paintings fully generated on site or in the studio? LG: I start with connecting elements in the space to form my shape for the painting. The most important decisions are probably made in the space, and then the fine-tuning very often takes place in the studio. For instance, in the Whitechapel [Whitechapel Open 2015] I tried to make every decision in the space. I usually take around five days, but often I am invited somewhere where I have to travel and then stay, and realistically it is often two days that I have there. I insist that I have to see the space - I cannot work from photographs. 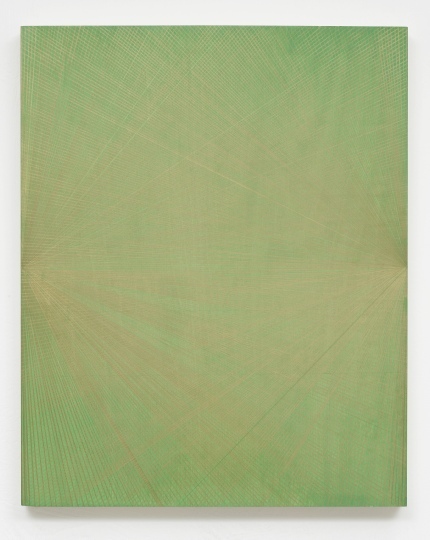 The works are all about tension or discrepancy between the reality of the space and an abstract idea. I see the space, and I design this abstract painting in my studio, which then changes again completely because of the reality of the space. The moment it’s painted onto a wall, it becomes part of the space - part of reality, never completely abstract. There is a transition between abstraction and the real space; it’s this play that interests me. HH: Is there ever a process of revision involved in translating the painting into that space, once you arrive on site? LG: There is a time where it is getting adjusted to the space. Even having done it for years, I find it staggering that the moment you come the second time, it looks so different. You always overlook tons of things. The colours are usually fixed; they are decided. For the shapes, sometimes you have to make decisions on the fringes of the work. Do I stop with a line here? Do I leave that white? Do I paint the skirting board? Usually they are quite conceptual decisions; do I paint only the wall and nothing that sticks or will be painted? Or do I paint it and make it disappear? HH: You originally started out studying design at university in Germany – how has this influenced your later practice? LG: I started in Aachen where I studied visual communication. I chose design because I was a huge fan of modernism and Bauhaus. I didn’t want to go to the Academy, because I thought they were just drawing horses there! Then I did theory mainly – I did an MA in aesthetics at the University of Wuppertal with Bazon Brock, which was quite an experimental course where they had architects, designers and artists, and they did their own kind of MA. Afterwards I studied at an academy at Dusseldorf, and then painting at the Royal College in London.Architecture was always a big influence, and I was probably more passionate looking at buildings than going to an art gallery, for a long time. I think that I love the spaces where I can transform myself into a different identity or world. I was never really interested in the functionality of places – it was mainly either non-finished or ruined architecture. It was always spaces that are ‘in between’ and this is quite similar to the works where I create spaces that sneak in between what the space is actually meant for. HH: I was interested to hear that you were influenced by the Baroque as well as Modernist architecture? LG: Yes, this is something that I discovered later. Baroque is something that I grew up with, because in Southern Germany you have lots of Baroque churches and castles. We had one church where we always went, which had an amazing ceiling painting and it was a fantastic late Baroque, almost Rococo, architecture. When I was a student, I loathed Baroque and didn’t want anything to do with it! I wanted the opposite – it was later when I realized a connection with the way that I look at space; I was hugely influenced by the idea of Baroque architecture, which is a celebration of ‘non-existing’ space. HH: We first met during a recent panel discussion hosted by Saturation Point at Flowers Gallery. 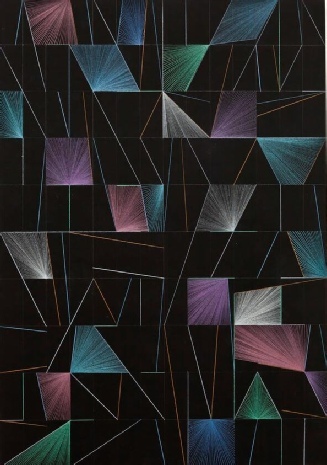 During this, the question was raised as to whether the modernist notion of a Utopian dimension to abstraction was still relevant to the practices of artists working with systems and geometry today, or whether it was a failed experiment. You responded by saying that you were interested in finding your own ‘personal utopia’, but that you were also interested in exploring a ‘darker side’ of abstraction. How does this manifest itself in your work? 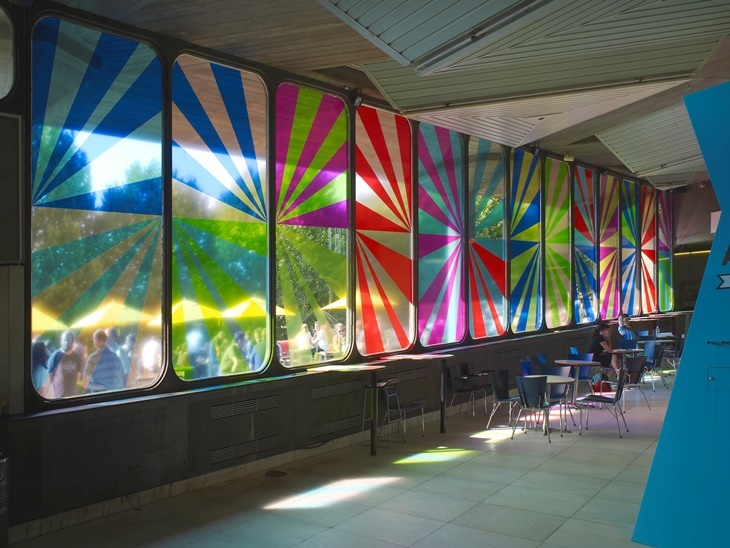 LG: When you work in the public realm, let’s say an entrance hall in a public building, and you make an intervention through colour, I think you do add a different layer of meaning to the space. Any person going in there has the possibility to escape into that space. They can transform themselves. And this has something to do with Utopia, because anywhere that you can transform yourself into something that is not the day-to-day reality is Utopian. In my eyes, this is political - it is a bit cheeky I think - you can have a different identity and a different life in that space, just for a few minutes, than the one that is given to you. And this is something that I find very important in social structures; the complete essence of a liberal democracy is that, whenever you want, you have the possibility to change your identity. If you put an abstract layer, or you put something abstract in a building, what is happening is that it changes how we see all the other details. It’s mainly a change in perception – I think therefore just an intervention with a line can make a complete change and not just optically… I am not talking about big political statements; I am talking about these tiny things, which interfere with our day-to-day life. When we talk about visions, we think of something positive, but there are of course negative visions and how would you then abstract that? If I wanted to dig a little and discover the ‘dark side’, I found this extremely difficult… to explore that with colour – is everything then black? The thing is that black is immediately stylish – so dark feelings just start looking elegant – and I found this personally difficult. HH: Your public art projects include the Festival of Love at the Royal Festival Hall; the London Underground; and at schools and hospitals. Do you respond to these in a very different way than you might in an art gallery situation? LG: I think what is different in a municipal space, for example a hospital, is that you have a given context to which you can respond, and that is completely out of my control. In a gallery space, you can change things; it is more of a blank canvas and not everything necessarily has to stay the same. Along with the architecture, there is a social element (the use of a space), which is as important as the architecture or the spatial quality. The moment you enter a public space there is this question of responsibility - what am I doing - how much can I interfere? Usually if you paint a painting in your studio, you don’t have to make a decision while you’re doing that – (a moral question of ‘is this dark?’ Or ‘is this good or bad?’); you can bring in the worst of all emotions: aggression, anger and everything, and that’s fine. But the moment you are in the public space and you have these briefs, then you have a responsibility for the people who are using it – especially if there are vulnerable people. HH: So, can it be a relief to come back to the studio? LG: I think you need both. For years, I did mainly site-specific works in the public space, and then I found myself a little exhausted with it. It is a very different way of working compared to being in the studio. You become the person that has to organise everything. When I wanted to discover more of that ‘dark side’ of abstraction I preferred to do this in the drawings in my studio - I could not do that in a hospital. HH: What are you working on next? LG: I am working on a show next year in February at the Collection Museum, Lincoln, where I will do a wall painting in response to the Duncan Grant murals in Lincoln Cathedral. After I graduated from the Royal College, [fellow student] George Shaw took me there. It’s very yellow, and I really responded to that. I start working on that over the summer. HH: Thank you very much, Lothar. 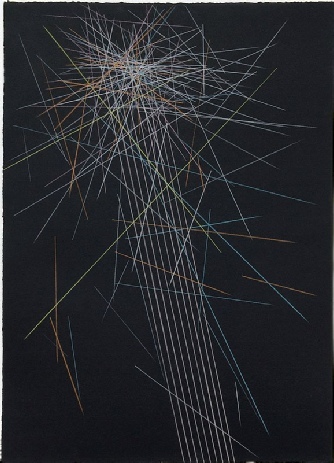 HH: The recent drawings appear to have some underlying geometry and rules, but they also have irregularities – how do you plan them, and at what point do the marks become intuitive? LG: I do measure at first. [In Purple Rain] it is very simple; here the important thing is a diagonal line. I don’t measure the distances between the other lines; this is done by hand and eye. In Purple Rain it’s a little bit irregular and that’s really important to me. One could do that with a completely perfect computer printout, but that’s not what I'm interested in. 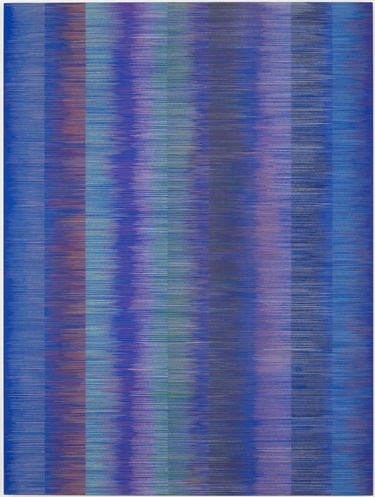 In Untitled (2012) there is some measuring of the bands; there is a fixed line, but the other ones end wherever they end. They feel like they are getting meshed – it is like weaving a carpet. In Reflection-Purple, 2014, I made a grid; within that shape, it is not measured. 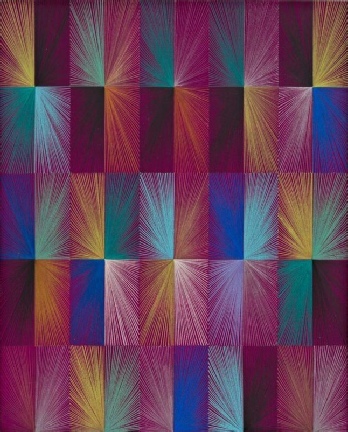 I think when I lay out a grid, it’s so that the canvas isn’t empty; I can respond to something, I have a kind of space.